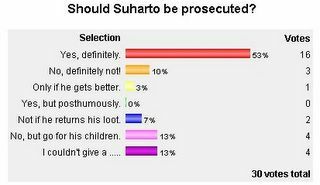 About 60% of my regular readership have voted in my poll and only 10% feel that Suharto shouldn’t be prosecuted. I’d be interested to know why given that c.76% would like to see some form of retribution for the abuse of power during his regime. Only 13.3% express no interest in the affair. So why vote? Just one day after losing the top executive post at Bank Mandiri, Edward Cornelis William Neloe was detained on Tuesday for his role in an alleged lending scam that hit the country’s richest bank. More witnesses and suspects have blamed General Elections Commission (KPU) chairman Nazaruddin Sjamsuddin for corruption at the national election organizer, making it more difficult for him to shrug off allegations over his role in the high-profile case. BRI (Bank Rakyat Indonesia) has recently been in the media spotlight for alleged bad loans dispersed to PT Domba Mas and investigations of improper tendering for its IT System. The council’s Commission A, which investigated the alleged misuse of funds by KPUD (Jakarta’s Election Commission) members during the 2004 elections, said earlier it had found alleged irregularities resulting in state losses of about Rp 13 billion. Commission A alleged the KPUD had failed to pay Rp 4.2 billion in income and value-added taxes. It also discovered questionable tenders and the alleged markup in the purchase of 180,000 vests for Rp 12 billion (or Rp 66,000 each). That price was far higher than the market price of Rp 25,000 per vest, the commission said. The KPUD has also been accused of marking up the rental fees on the three houses it uses for offices in Kepulauan Seribu regency. According to a report from the KPUD, the rent on the three houses totaled Rp 170 million a year. However, it is believed the commission only paid Rp 25 million a year to the owners of the houses. A defense lawyer for 17 Depok councillors on Tuesday pointed to what he said were various defects in the prosecution graft charges laid against their clients for corruption some time during their terms from 1999 to 2004. The councillors stand accused of authorizing the misuse of Rp 7.5 billion (US$797,872) out of the Depok budget to cover their personal expenses, including the payment of installments on houses and cars, and the payment of telephone and water bills, and insurance premiums. Most of the defendants have been reelected for the current 2004 to 2009 term. The director of the Muarojambi Public Works Department had allegedly been responsible for irregularities in three projects worth Rp.788 million (US$83,829) which were awarded last year to one contractor. None of the projects have been completed. Collusion is suspected. Seven years after the fall of former authoritarian leader Soeharto, there has been little improvement in people’s welfare and law enforcement, former student activists say. Jakartass does not believe that all is doom and gloom. That these stories are in the mainstream print media and that we can openly criticise corrupt politicians and businessmen is genuine reformasi. What is needed, of course, is more action to go with the words. I suspect that there is more corruption in the UK.